MK Yachimovich says if she does not defeat Netanyahu, she will head opposition. 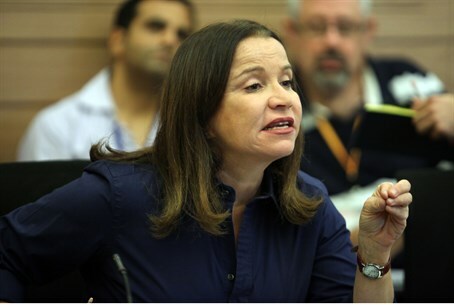 Labor party head, MK Shelly Yachimovich, stated Thursday that she will not sit in a government headed by Binyamin Netanyahu. "There are only two possibilities," Yachimovich said in a news conference Thursday morning. "Either the Labor party under my leadership will form the next government, or we will head the Opposition." After months in which she refused to say outright that she would not join a coalition headed by Netanyahu, Yachimovich changed direction and made the statement. Pundits surmise that the reason for the change is her party's declining performance in the polls. Yachimovich believed that voters from the center-right would support her if they thought she would join a coalition headed by Netanyahu. However, her policy of ambiguity appears not to have pulled in these voters, while costing her voters from the hard-left base. Yachimovich explained her change of tack, saying that "this is no longer the Likud we know. It is Feiglin on the one hand and Lieberman on the other. There is a very serious movement toward the extreme in every possible field." She added that the Jewish Home's recent success in the poll has caused Likud to veer rightward as well. "There is wild and odd competition between Netanyahu-Lieberman and the 'Orit Strooks.' Prostrations on the Temple Mount, talk of transfer, of annexation of Judea and Samaria." Likud Beytenu's Elections HQ head, Minister Gilad Erdan, reacted strongly to Yachimovich's accusations. "Shelly Yachimovich is lying and she knows it!!!... She has lost control over her radical leftist list and is now trying to appease them," he said.